Attention all you lovers of the perfectly flawed! Are you ready for more eye candy from the Warrenton/Round Top Antiques Show? As you can see, she is a very crafty lady. So sit back look closely and enjoy! As a side note, my paternal ancestral roots stem from Round Top, and nearby LaGrange has an interesting ancestry and family research library. 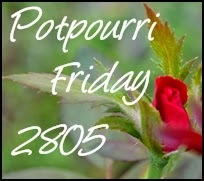 You are invited to Potpourri Friday! 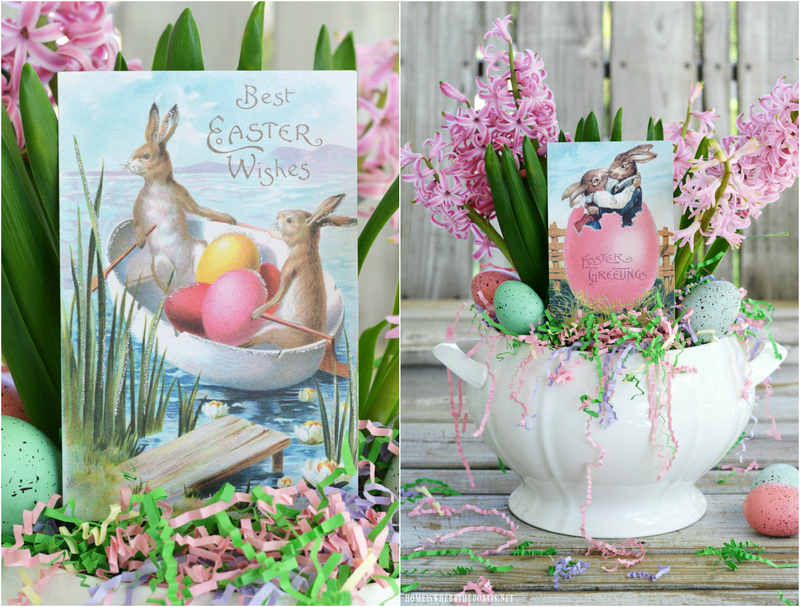 Candy post on your Facebook Page and your Pinterest Page! Oh what fabulous prettiness! I just love the little legs on the vintage suitcase and those wonderful vintage lace ornaments. So many charming ideas...thanks for taking me in the tent!!! Oh how I would love to go to Round Top some day. 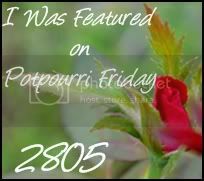 Everything I've seen on the blogs has been gorgeous. What great eye candy! Lots of goodies to splurge on. Thanks for sharing. This is all so beautiful! Does she have a blog? Wow! Love the bits of lace, the lampshades - so much 'eye candy'! You must have had a terrific time! Honey, What a beautiful booth. I would love to go to Round Top one day. In the mean time I'll just drool over your pictures. 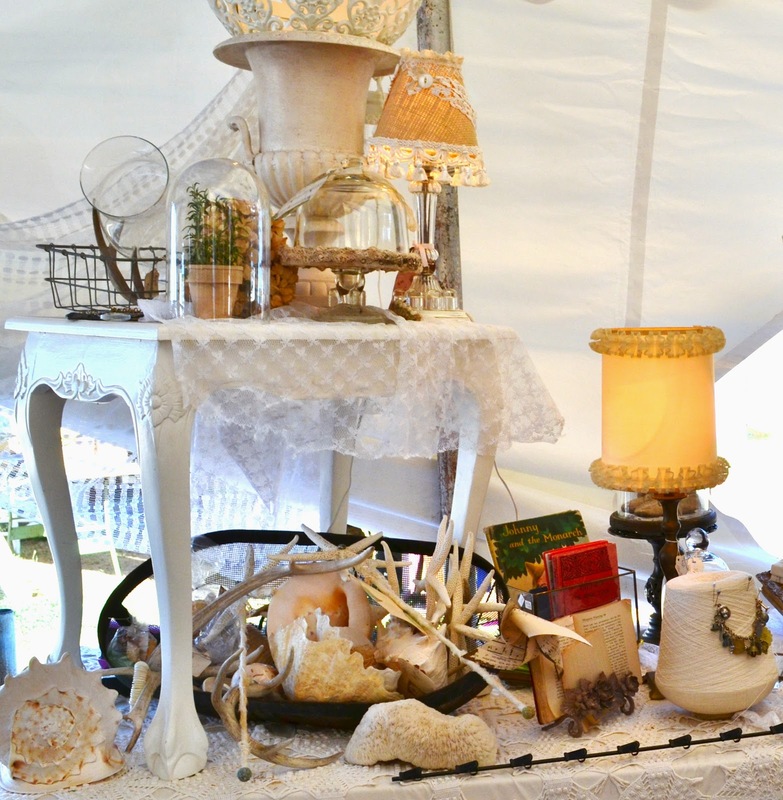 what a lovely tent full of wonderful things! What a fun trip! That's a dream trip for me, maybe someday! Wow, I love all these pictures. What an amazing transformation on that little suitcase! Lovely post. Oh wow..what a fun place to shop. Did you find some treasures? It's on my bucket list!! Just gorgeousness!! That lace....soooo beautiful!! Love this! What eye candy, indeed. Soooo many things I loved! You definitely have the "eye candy" going on here! Love everything, especially the lace lampshades and the old suitcase! Great finds! Love what she did with that suitcase - and the lamp shades are great too! Thanks for sharing! Now following you via Blogger and Pinterest. Hope you can follow back. Honey, these are such pretty images! 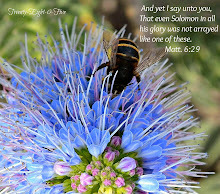 You always find the greatest treasures!!! I'm in love with the vintage balls in the suitcase...the rest is pretty good too! How pretty, this will take a couple of tours through your photos to take in all the pretties here. Must have been hard to leave this place. I could spend hours there. Wow...Lots to see! So many great ideas!!! Thanks for the photos!!! That suitcase with legs is such a cute idea. Oh I like her booth. Was she in Warrenton? Doesn't look like a Marburger tent or The Big Red Barn. Glad you had fun. Now that is some beautiful eye candy Honey! I could have spent hours there. P.S. Your fall tablescape is gorgeous! Oh how I wish I were in Texas right now. I have been wanting to go to Round Top for some time. Wow!! That is an eyeful of wonderfulness!!! I love the way everything is displayed -- I am going to have to pin this entire post -- so many cute ideas! Love those little boxes made from book pages! Eye candy is right! What a fun time, I sooo love going to places like this! 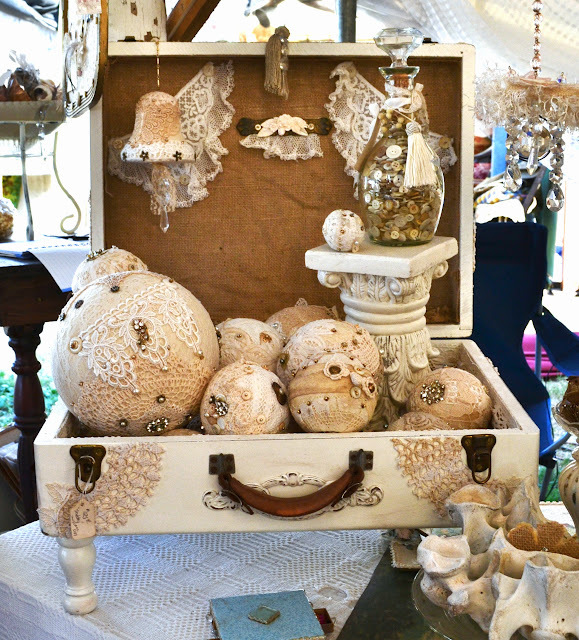 I love the Beautiful Vintage suitcase and all the vintage lace ornaments !! Thanks so much for taking us all along with you. Is this shop in Houston??? You'd think I just drank a gallon of caffeine. After seeing this post, I had to get up from my chair, makin' plans to change my own world around here. Amazing ideas! Shared this on FJi Facebook for SNS 103 and pinned it! Thanks for sharing Round Top eye candy with us. I have always wanted to visit the flea market. LOVE all that eye candy Honey!! Gorgeous!! Thanks for linking up! Love everything you've shown here...gorgeous stuff! I've been sick all week and am dying to get busy on something! Hi, I'm Janice, a new follower! 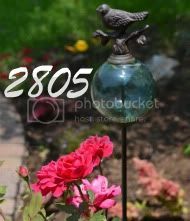 I just came across your blog from Funky Junk Interiors Pinterest page and love all the pictures you shared! Can't wait to look around on your blog some more.